A review of the first novel translated from Lingala, an African language spoken by between 7 and 10 million people. 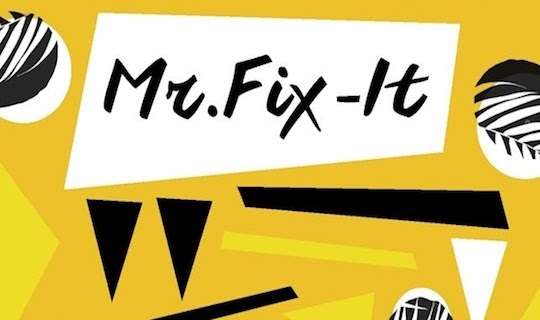 Richard Ali A Mutu’s Mr. Fix-It begins curiously enough with a list of items that its protagonist, Ebamba, and his family must procure as a bride price to obtain the hand of his girlfriend, Eyenga. Over the opening pages, the goods range from the mundane (three bags of rice), to the supposedly traditional (baskets of kola nuts), and the extravagant (two three-piece Versace suits). As negotiations carry on and break down, with the would-be bride questioning the need for this process altogether, a rain-storm recalling the one that wipes Gabriel García Márquez’s Macondo off the map in Cien años de soledad forces everyone inside to conduct business inside the house. Everyone decides to pause for a while as due to the leaky roof “people [run] out of dry places to sit” and “The rain is coming down as if someone had opened a giant faucet and the family is frantically putting out more and more buckets to protect the carpet” (12). Despite the optimism one may glean from this inauspicious opening’s relation to the work’s title (Mr. Fix-It being a stylized translation of Ebamba’s name, which literally means “mender” in Lingala), the rain stands in for the larger structural problems faced by the people of Kinshasa at home and within the world economy. For example, “the Chinese” paved the now flooded street and put in the stopped-up sewers, and the residents themselves are at a loss to explain the failed development project. Some blame poor Chinese workmanship, others the neighborhood’s witches. Whatever the explanation, the roads are flooded and the sewers broken. And what about that roof? The astute reader of African literature will thus find the novel taking up colonialism’s inescapable structuring of the present as found in novels such as Chinua Achebe’s often overlooked No Longer at Ease (1960). As with the main character of Achebe’s novel, the orphaned Ebamba obtains an education but enters a broader economy where power relations, colonial and otherwise, shape one’s destiny regardless of one’s talents or intents. The mayor, the president, and the director of a company where Ebamba applies for a job all lack names, suggesting the utter dehumanization connected to dealing with them. Yet the novel reminds us that, these difficulties aside, Ebamba, the mender, remains the master of his own fate, and the choices that lead to his destruction are his alone.